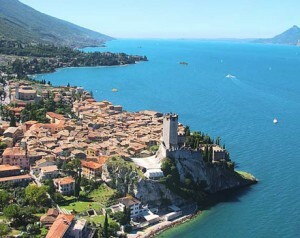 Garda Lake is certainly famous for its favorable climate , and even more for its constant and regular thermal winds. More precisely the “Peler”, a north wind, blows during the morning , from 7.00 am to 11.00 am; instead the afternoon is characterized by the “Ora”, a south wind, which blows from 1.30 pm until 6.00 pm. While sailing is practiced all over the lake and the area around Torbole is famous since the ’80s for windsurfing, in the recent years Brenzone has become a Mecca for kitesurfers. 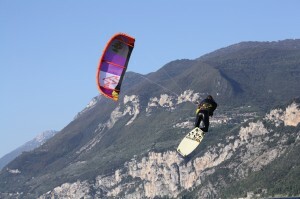 The increasing popularity of Brenzone among kitesurfers is justified by the peculiarity of its thermal winds. In fact, the “Ora” having an intensity of 12 – 17 knots is particularly suitable for beginners, while the “Peler”, with an intensity ranging from 14 to 25 knots is typically appreciated by more experienced kiters. 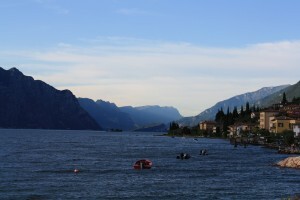 Another distinctive feature of the Garda Lake is represented by the absence of adequately spacious beaches. This natural obstacle has been overcome by the kite centers in Brenzone thanks to an innovative approach: the use of boats, commonly referred to as shuttle service, for the launching and landing phases. 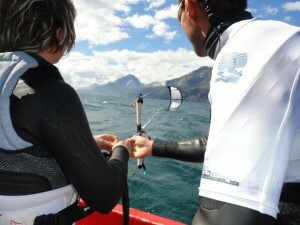 In addition this system has generated undoubted advantages for kiters, the most appreciated being: increased support and assistance, the possibility to try out maneuvers without worrying about going back upwind, the unique opportunity to be taken by boat on the best spots and last but not least a huge space to ride with a breathtaking view surrounded by magnificent mountains. The Centro Kite Marniga offers all of this, together with a variety of courses tailored for all different levels and ages. The teaching methodology we have developed in this center, based on the use of boats and radio helmets, significantly reduces the learning time and improves the quality of the courses.